They say that inventors should find a need and fill it. 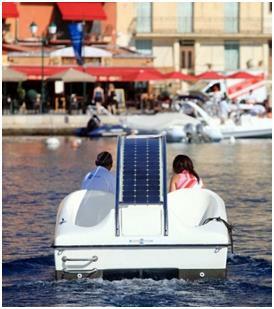 I don’t know who needs a solar boosted pedal boat, but a design concept for one exists nonetheless. The boat features a center cockpit where up to four passengers can sit, alternating pedaling duties in two-person shifts. When you get tired (which should be after only a few minutes), switching to solar power can help lighten the load. I’m not sure if this concept will ever see the light of day, but in a world filled with non-solar powered pedal boats, it would be a welcome improvement. When gas prices were at their highest, spending the weekend on your boat wasn’t really an option unless you had a couple hundred extra dollars to waste on fuel. 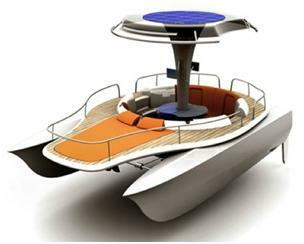 This solar powered boat concept can go all day without ever visiting the gas tanks – and when the sun’s not enough to keep you moving, just start pedaling! There were a few hiccups along the way, including a frustrating three-day wait off the coast of Australia when a storm blocked out the sun.“We have everything at our disposal: the know-how, technology, raw materials and renewable energy to become sustainable and protect the planet,”said the engineer, a nature lover who is also a pilot, ambulance man and mountain guide. Planetsolar can produce up to 500 or 600 kilowatts per hour in good weather – enough to travel 300 kilometers when the battery is fully charged using engines no more powerful than those on a scooter. Everything on board is solar-powered: from the boat’s engines and the on-board computers to the hot water and the light bulbs. “The boat wasn’t easy to build, but we built it in a record time of year-and-a-half years,” said Jens Langwasser, 28, the chief builder. “We had a lot of problems with finding the right panels, the right battery. It hasn’t been easy. This is solar energy. You go on the road with storms, rain and all types of conditions. You never know what will happen.”As the boat requires maximum sunlight to move, it had to sail as close as possible to the Equator and follow routes that constantly had to change, based on how much sunlight was forecast for any particular day. Erwin said that despite all the frustrations he was thrilled about the implications of solar-powered travel.Ibor, a resident of Calvi where the ship arrived on one of its final legs of the world tour, said he was impressed.Raphael said he has managed to show to industrialists, businessmen and politicians that his were not just fantasies from the novels of Jules Verne such as “Around the World in 80 days”, but feasible ideas. His first victory is already secure. As the Planetsolar was passing the Galapagos Islands, the government there decided to ban access to one of the archipelago’s islands to all boats except for solar or electric-powered ones.